The National Highway 702D between Mokokchung in Nagaland and Mariani in Assam was blocked on Monday by a massive landslide at Yimyu Ward in Mokokchung, between IOC to Jail Area. 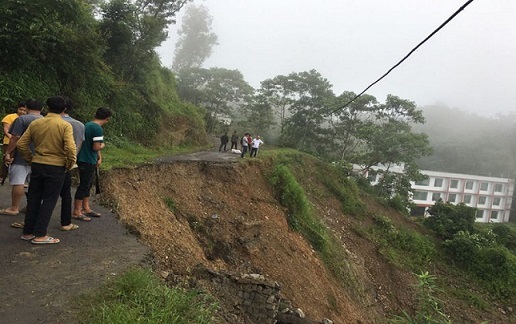 Sources informed that the Public Works Department has engaged two excavators and a dumper to clear the nearly 200 meters of road block due to the landslide. Landslides also took place at Perizie colony in Kohima below Razhükhrie Govt Higher Secondary School playground where at least 43 houses including 35 mud huts and eight RCC buildings were damaged on July 22 last. Incessant rainfall has triggered fresh landslide in the area since Sunday. The colony road and KMC dumping road have been totally cut off by landslide, which occurred one km below the colony. Meanwhile, due to incessant rains on Monday, a house was damaged by landslide at Middle D Block in Kohima.